I just found this video yesterday from John Piper's Facebook. It is a 5 minute Gospel presentation. I was so impressed with how they used simple graphics to help illustrate and how they carried the trinity through the whole thing. Joel and I switched rooms with Noah. We had originally given Noah the bigger room so that we could fit the bed and crib in his room. We changed our minds and took the bigger room so that we could fit the crib in our room and use it when Isaac outgrows the cradle. We'll put Isaac in Noah's room when he is ready to be in he bottom bunk of a bunk bed. We'll see how that works. Noah in his new room. His room is now the first door down the hallway. I put the gate up right after his door and let him play in his room or the living room whenever he wants to. a few drawers of toys and his dresser. We didn't really trick or treat. We dressed them up all cute and visited the grandparents so that Noah could have fun being a lion. Isaac got to hang out with Great Nana too! Mom and Dad scored hot chocolates at Dunkin Donuts and Noah got some sweet goodies from Granny and Papa and Grammie and Grampa. I like my SIL's post on "To dress up or not to dress up: The Halloween question." and someone's comment on Facebook, "Yes, God can redeem Halloween!" because it would be foolish to think he couldn't. We aren't really sold about how involved we would want to get in Halloween, but we're happy to play dress up with the kids and visit their Grandparents for pictures. I know we want to talk about and celebrate Reformation Day, but we are going to have to figure out how to be creative with that. Anyone seen a kids book about it? 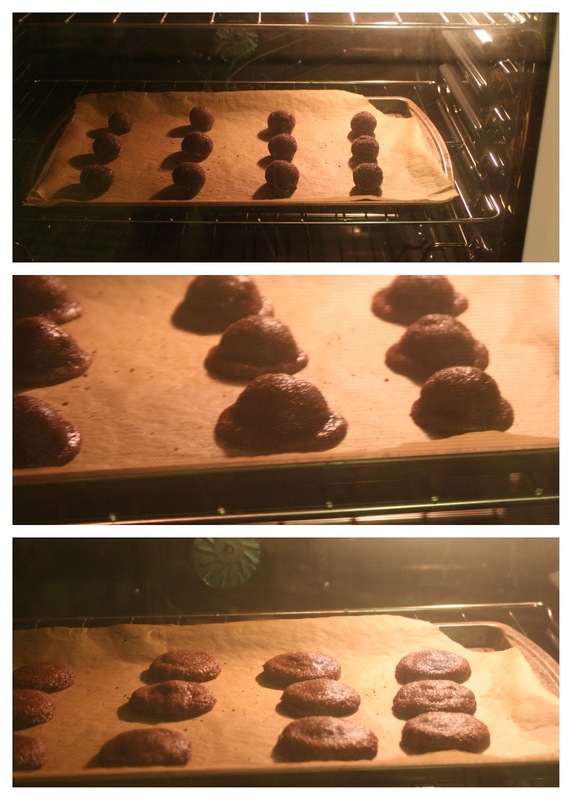 These Top Secret Chocolate Cookies are not healthy. I used fresh ground soft white wheat and organic sugar cane, but that is still sugar. These were another example of finding a recipe that I had all the ingredients for in my cupboard. I wanted a cookie, and I wanted chocolate - but I didn't have chocolate chips. I have a light in this oven and thought it was fun to watch the dough balls turn into little puddles! 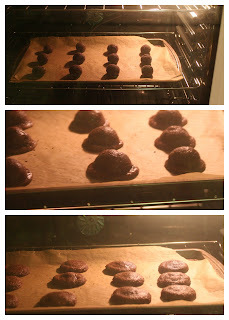 Those pictures of the cookies through the window on the oven are the closest I have to pictures of our new stove. Our propane ran out and unfortunately, propane is a lot more expensive than electric. We had agreed a while ago that when the propane ran out, we would buy an electric range. I'm used to cooking on a flat top electric stove from when we lived in Egremont, so we chose one with features that we thought we'd be happy with for the next 20 years. The faithful old propane one we had been using was original to this home 20 years ago. A friend of mine shared this on facebook and I thought it was pretty cool. I had heard about health benefits of coffee and tea, but this graphic is so pretty and has a lot of cool info.